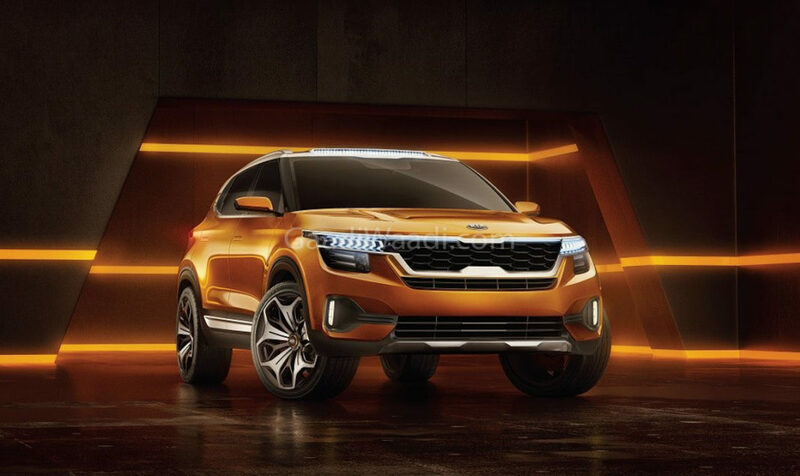 Kia Motors officially confirmed that the company will introduce its first model in India by the middle of 2019 and it will the production version of SP Concept, which made its debut at the 2018 Auto Expo. The compact SUV has been already spotted testing in Korea and the test mule has been spied in India for the first time but the prototype is camouflaged heavily to hide details. The overall design theme looks similar to the concept model as the front get same tiger nose grille, which extends towards LED DRLs and the projector headlamps are placed below it. The front bumper design is also same with faux skid plates at front and rear. The black plastic cladding running across the body will be retained in the production model also. The square wheel arches come from the concept and prototype gets machine cut alloy wheels. The rear gets LED tail lamps along with new bumper and an integrated spoiler on top-spec models. Kia is expected to give same interior design theme as other models and we can expect the quality of materials to be top notch. The SP Concept production model will be loaded with features like touchscreen infotainment system with Apple CarPlay and Android Auto, climate control, cruise control, leather seats, sunroof, reverse camera with parking sensors, wireless charging, keyless entry, push button start, rain sensing wipers, rear AC vents and more. We can expect the compact SUV to come with dual airbags, ABS and EBD as standard while top-end models might get 6 airbags along with ESP and other advanced safety features. The SP Concept production model will be based on the same platform as Hyundai Creta and the company might share some components to keep pricing on the aggressive side. Kia is working on a new 1.5 L diesel and petrol BSVI engines, which is expected to produce around the same power output as current 1.6 L engines from Hyundai. They might also introduce the 1.0 L turbocharged petrol engine also. The transmission options include automatic and manual as four-wheel drive system is not expected to be offered.